Of course, we are not an MLM company or any Pyramid Scheme or Scamming people, all of these allegations are false and just an attempt to discourage people from becoming a part of the Bitcoiin2Gen, Crypto-Currencies, and Crypto-economies. The fact is that we are only providing potential investors the chance to earn through promoting us via a 4 level commission structure that will just EXIST during our ICO period only and it is not mandatory. The vision behind to adopt this structure is to lower our marketing expense and to take advantage of word of mouth advertising. To put things in perspective, we offer up to 50% off to larger investors while our total 4 level commission structure is only 32.5%! 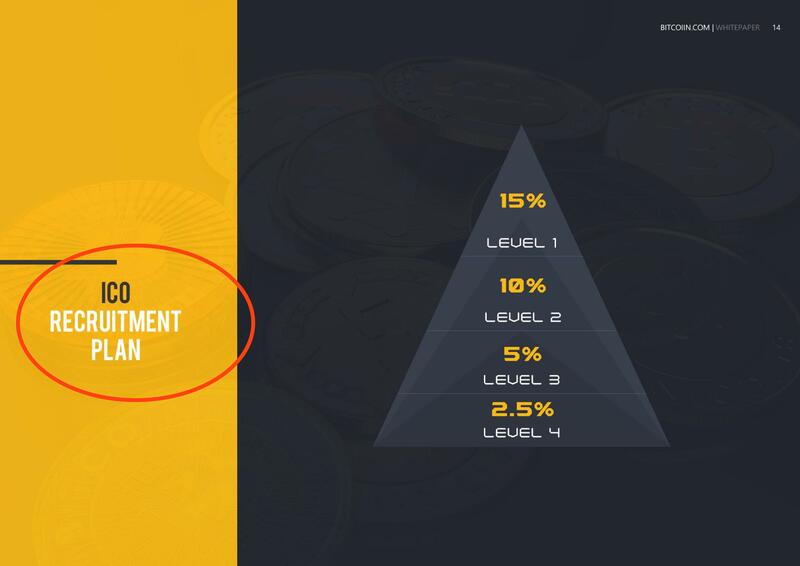 Therefore if people who actually reviewed our coin and took the time to read the facts mentioned in our white paper they would understand that we have no resemblance to any MLM type of coin structure company and that our primary purpose for the 4 level commission structure during the ICO period only as it is highlighted above in the picture as “ICO RECRUITMENT PLAN”, is to promote our brand to like-minded individuals further and lower the expense of paid media. For a fact being anonymous or being physically present doesn’t increase or decrease the efficiency of any cryptocurrency and Bitcoiin2Gen is not entirely anonymous as we are using the Ethereum Blockchain, which is an open-source, decentralized public ledger where all the transactions in the network are recorded. And, We adopted the same framework of Bitcoin, to create a decentralized self-sustaining ethereum blockchain based cryptocurrency that uses cryptographic proof of work protocols. But, We still believe in anonymity, Anonymity in cryptocurrencies is a matter of not just personal privacy, but also Confidentiality. To appoint Mr. Steven Seagal as our Brand Ambassador is part of our marketing strategy to promote our brand and increase the awareness towards Bitcoiin2Gen and Cryptocurrencies. It is not new to have a Celebrity to promote a brand, almost all the mass market products and services are being promoted by celebrities, So there shouldn’t be any problem if Mr. Steven Seagal is promoting a cryptocurrency, cryptocurrencies are the digital form of the currencies, that are the biggest mass market means to buy or sell goods & services digitally. Notably, We appointed Mr. Steven Seagal as brand ambassador to promote the brand; therefore nobody should link this endorsement as investment advice as neither he nor we ever advised so. Mr. Seagal has millions of followers across the world, and by his influence now we are reaching to them, which was never possible through our other marketing strategies. And yes this endorsement is bringing us a lot of popularity but most assuredly Bitcoiin2Gen’s being self-sufficient coin is the only reason enthusiasts are participating in ICO or becoming part of the Bitcoiin2Gen. To summarize, we would like to inform the community that we are not an MLM company or a Pyramid Scheme or any Scam. Bitcoiin2gen is a legitimate cryptocurrency, which uses Ethereum Blockchain. For a fact, B2G is an ERC20 token as it is easy to distribute to investors during the ICO period. Once the ICO ends, and coin goes live B2G will be converted into a mineable coin, and after that enthusiast can mine B2G for incentives, the details of mining pools and machines will be available soon on our official website https://bitcoiin.com/. Regarding our White Paper, it shows the most basic concept of our plan, is to create a self-sufficient eco-system based around B2G. For this to occur the coin requires its Wallet, its Exchange, its Mining Pool and Mining Equipment, Since we are using the Ethereum Blockchain, and P2P payment system same as Bitcoin, we don't think so we need to explain it as it has done by Vitalik Buterin in the Ethereum White Paper and by Satoshi Nakamoto in Bitcoin: A Peer-to-Peer Electronic Cash System. For more information please contact us on support@bitcoiin.com.